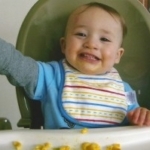 Ruth’s mother, Betty Todd, was the first fatal dog attack victim in 2013, a year when 32 people in the U.S. died from dog maulings. The pit bull was a family member and Betty, 65, was babysitting her grand-kids when the dog killed her. 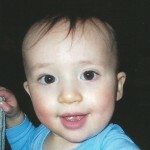 Her tragic story is repeated year after year in an annually increasing number of severe and fatal attacks. The billboards and bus shelter signs are the first of their kind anywhere in the world, and their purpose is to provoke thought and debate. 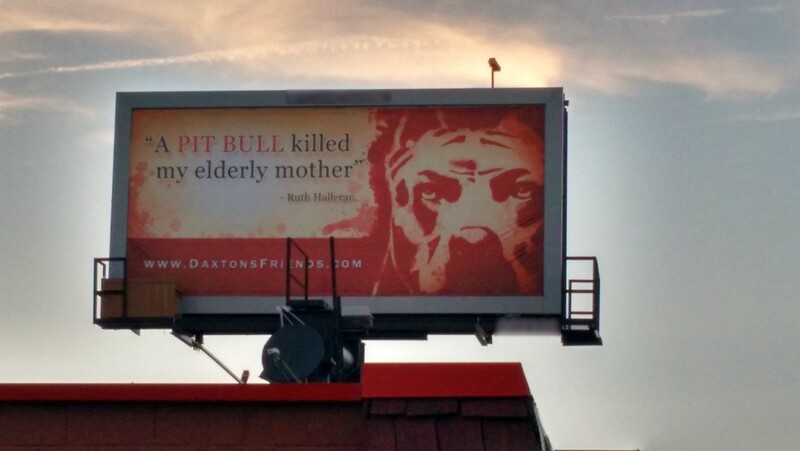 Daxton’s Friends for Canine Education and Awareness sponsored the billboards through donations, in the hope that people will contact the organization for information about dog breeds and safety. 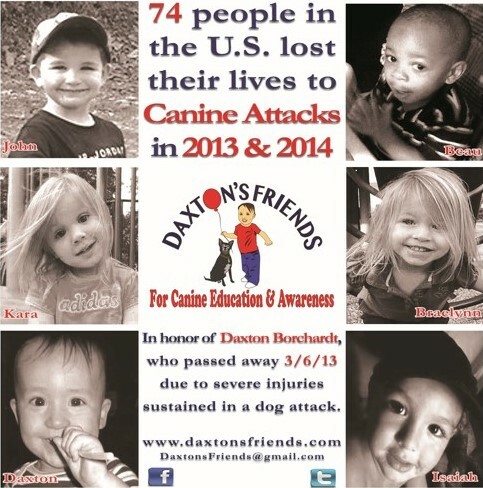 Daxton’s Friends, a non-profit educational organization, was formed in 2013 after founder Jeff Borchardt’s 14 month old son, Daxton, was killed by two pet pit bulls in the home of a friend. Jeff Borchardt says “We tell the truth about pit bulls and other fighting breeds and provide honest information about all dog breeds so that families can make a better decision than we did.” He also supports restrictions on pit bulls, such as mandatory spaying and neutering, specialized confinement measures and liability insurance. Pit bulls are responsible for more than two-thirds of all mauling deaths year after year; more than all other breeds combined, although they comprise only six percent of the U.S. dog population. A significant number of the dogs that killed passed “temperament tests” and had never shown signs of aggression before they mauled someone. 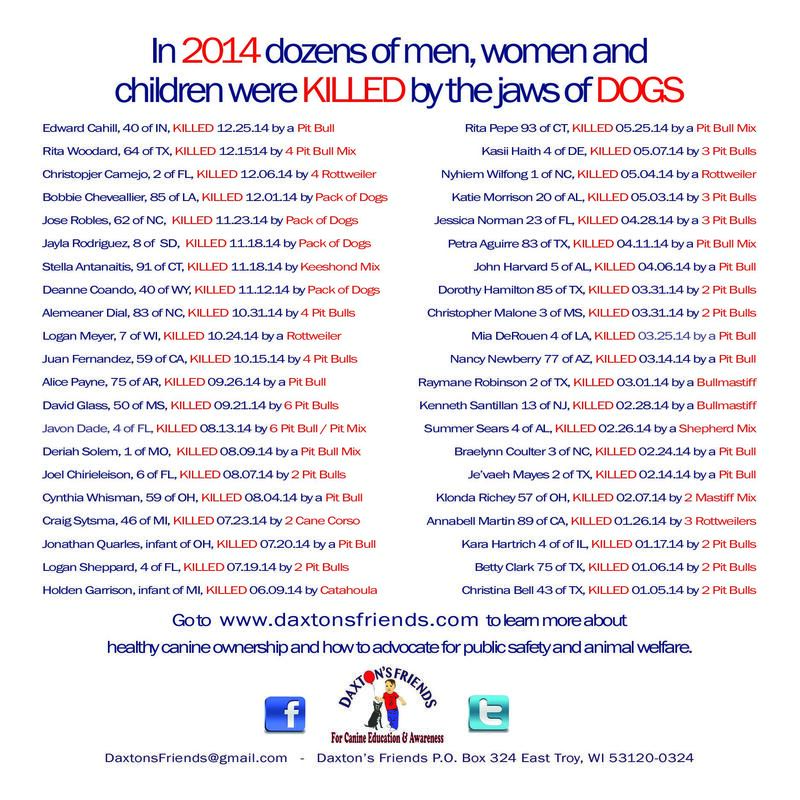 The state capital in Columbus may be a hotspot of controversy tomorrow, May 30, beginning at 9:00 a.m., when volunteers for Daxton’s Friends for Canine Education & Awareness unveil an art exhibit depicting more than 40 U.S. victims of fatal dog attacks within the past 17 months. The majority of the lethal dogs were pit bulls. Midday, a pro-pit bull group plans a rally to promote its own cause – ending “breed specific legislation” (BSL) in Ohio and wiping out communities’ right to home rule and public safety regarding known dangerous dog breeds. Ohio has been the location of several fatal and disfiguring pit bull attacks, and more than 70 Ohio municipalities currently restrict their ownership. Ohio towns would no longer be permitted to restrict dog breeds known to inflict fatal or maiming injuries if an anti-BSL law is passed, as has happened in several states. Concerned Ohio residents and victims’ rights advocates from other states joined efforts to bring “Out of the Blue” to Ohio in order to separate fact from propaganda. 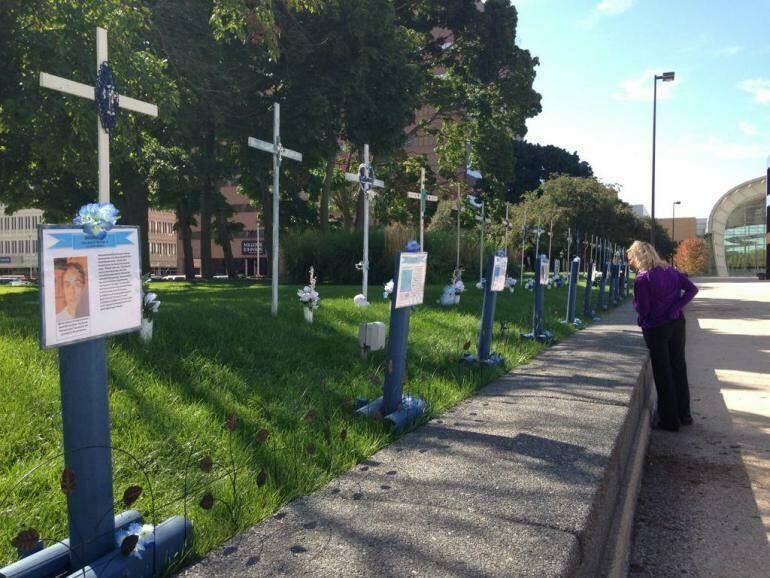 Last year, when “Out of the Blue” made its debut appearance in a Grand Rapids, Michigan Art Prize exhibition, pit bull owners arrived with their dogs in an attempt to block visitors’ access to the showing. Borchardt explains that just as pointers are likely to point, shepherds to herd, and Labs to swim, pit bulls are much more likely than non fighting-breed dogs to seriously injure or kill. They are responsible for more than two-thirds of all mauling deaths year after year; more than all other breeds combined. 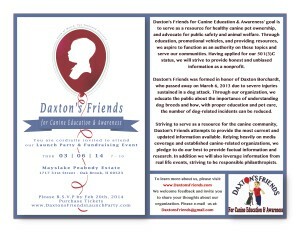 “Canine Awareness and Education” – Launch Party and Fundraising Event. Beginning a Tradition of Bringing Information and Knowledge to Families and Communities around the US. OAK BROOK, IL – As many of you know, we have started a non-profit organization to help further canine education and pet safety. 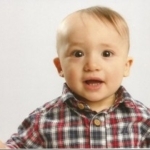 To mark the one-year anniversary of 14-month old Daxton James Borchardt’s death as a result of canine related injuries, Daxton’s Friends for Canine Education & Awareness will honor his life and legacy with this gathering. Please plan on joining us for an enjoyable evening of cocktails and hors d’oeuvres at the Mayslake Peabody Estate, 11717 31st Street, Oak Brook, Il 60523 from 7-10 PM on Thursday, March 6, 2014. This gathering will also serve as a platform to share our plans to support communities and raise funds to promote our mission. We are dedicated to bringing knowledge and awareness to the public about the importance of knowing dog breeds and their relationships to humans, as well as issues of safety regarding their care, maintenance, and selection. We aim to serve as a resource for healthy pet ownership, and to advocate for public safety related to canines. Having applied for our 501(c)(3) status, we are excited to be commencing our preparations for our Launch Party and Fundraising Event next month. With an ambitious goal of hosting over 50 guests, public officials, and representatives from the media, we are excited to be able to share information about our mission and future plans. Again, we deeply appreciate your support and want to thank you in advance for your participation and support of our organization. This first inaugural event is critical step in building momentum for the plans ahead. As a volunteer-run organization, all expenses must be offset through our various fundraising endeavors so we may continue our mission. We hope that you will attend this event. 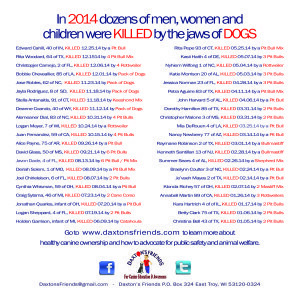 Please learn more about us on our website: www.DaxtonsFriends.com. 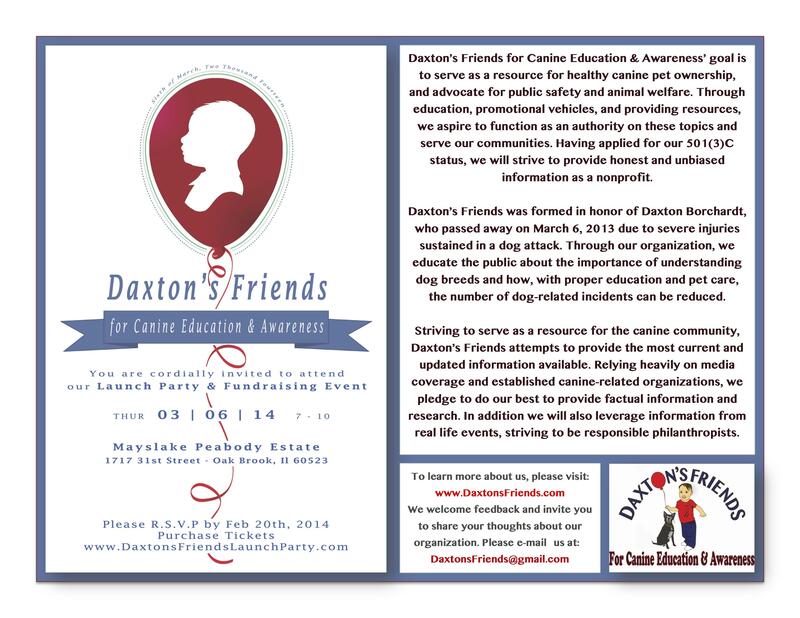 If you have any questions, would like to attend the event, or would like to learn more about Daxton’s Friends please contact us at DaxtonsFriends@gmail.com. Both Sam Madan and Jeff Borchardt (Board members for the organization) are working hard with members of the Daxton’s Friends to ensure that the kickoff event is a successful one. “The launch party is an essential component of our fundraising efforts, and we are very grateful to Tony Solesky, Dennis Baker, Ruth Halleran, Susan Iwicki, Beth Robbins, and Sharon Yildiz, as well as all of our Daxton’s Friends members for generously volunteering their time to help create a memorable evening.” said Jeff Borchardt, father of Daxton and founder of the organization. What a tremendous public service you provide. You may never know how many pit bulls have been removed from homes where a fatality or serious injury would have occurred because of your child’s tragic death and your unwavering commitment to preventing the same fate to others. Thank you, thank you, thank you. The pitple that somehow enjoy the pit bull deaths and injuries are slowly learning the truth too. If you keep telling what pit bulls have done to people and animals regardless of age, training, socializing, neutering, ownership, you are making many pit bull owners take a second and third look at their own pets, and they are getting rid of them at the first sign of instability instead of waiting for an attack. Thank you, thank you.